Portable buildings and sheds make great garden sheds, tool sheds, and workshops. 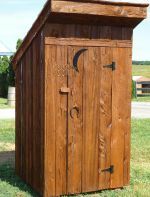 Prebuilt Portable buildings are an affordable solution whether you need a or bright and cozy gardening / potting shed, a tool shed, a workshop, or just the right place for storing your garden supplies and tools. We have the perfect solution! We offer a complete line of portable building solutions in wood and vinyl. Be sure to check out our full line of sheds for a variety of portable buildings choices and options. Have a question? Just ask. We are here to help you find the perfect portable building to be used as a your workshop, gardening shed, potting shed, or tool shed. Check out our FAQ page for information about delivery and setup in the Maryland, Virginia, West Virginia and Pennsylvania region. Note: Styles, availability, and prices are subject to change without notice. This shed is designed for the gardener in mind. It has 3 large windows, a work bench, skylights for additional light. Picture shown 8 'x 12' in Vinyl Light Gray with White Trim, Black Shutters and Black Architectural Shingles. Available in sizes 6' x 10', 8' x 10', 8' x 12', 8' x 14', 8' x 16', 10' x 10', 10' x 12', 10' x 14', 10' x 16', 10' x 18', 10' x 20', 10' x 22', 10' x 24', 12' x 12', 12' x 14', 12' x 16', 12' x 18', 12' x 20', 12' x 22', 12' x 24', 12' x 26', 12' x 28', 12' x 30', 12' x 32'. Other portable buildings and sheds also make garden sheds, tool sheds, and workshops. Click here to see more portable building and shed styles available. With a custom built garden shed, potting shed, tool shed or workshop, you can select each feature. Some of our most popular sheds are shown below to give you ideas for customizing your own building or simply order a model exactly as shown. With a custom designed portable building, you can select each feature. You have a choice of paint, vinyl siding and shingle color from our options. Any shed or portable building can be customized to be the ideal garden shed, tool shed, or workshop. Store all your equipment in one convenient place designed especially for those tasks. Create a customized work area to maximize the time spent on your business or hobby. Add extra windows, eliminate windows you don't want, move the door to a different side of the building to accomodate your specific needs, or add accents like flower boxes, a front porch for hanging plants, and much more. If you need extra storage, consider adding a loft area. Add a work table or shelves to make this the perfect place for all you gardening or woodworking tasks. Put a small table on the front porch and you can have lunch or work outside.